Census and HUD reported a decline in May housing starts and permits, but the headline numbers do not tell the whole story. First, the driver in the declines in both starts and permits was multifamily apartment construction, which was down to 376,000 starts (-7.6%) and to 372,000 permits (-19.5%). But the three-month moving average for multifamily starts is still the best since February 2006 and the decline is more the result of an extraordinarily high April. The same trend was evident in the multifamily permits, which adjusted downward after scoring a seven year high in April. Second, single-family permits were up 3.7% to 619,000 (seasonally-adjusted annual rate), the highest since November 2013 and roughly equivalent to the output for all of 2013. The increase in single-family permits was true for all four regions adding support to the continued modest single-family expansion forecasted by NAHB. The decline in single-family starts is likely a combination of factors including general conservative behavior of the builders that remains after a six year decline in housing production. Builders also continue to find low supplies of developed lots and construction crews. The supply chain difficulties have caused builders to postpone and lengthen construction schedules. 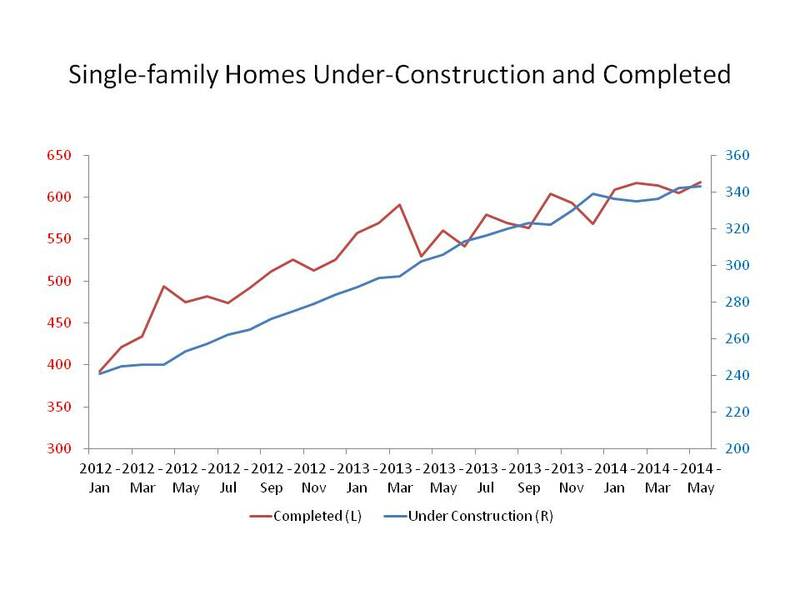 The number of single-family homes under construction has remained relatively steady at 340,000 for the past six months and the number completed just above 600,000 for the same period. The steadiness is evidence of builders continued conservative approach to adding inventory and the builders’ read of the same conservative nature of potential home buyers. As the economy continues to expand, consumer confidence in housing will return and the housing market will continue its modest expansion.